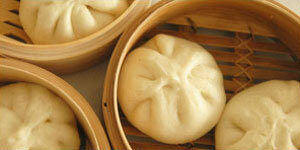 Serving up pork buns to our enthralled restaurant reviewer for pennies. It seems an incongruous place to find a rating most chefs would strangle their sous-chefs for. But the gamy Hong Kong district of Mongkok hosts the cheapest starred restaurant in the famed culinary kingdom of the Michelin Guide. It is Tim Ho Wan, a Cantonese eatery that for instance features for just HK$12 (US$1.53) three light, crispy barbeque pork buns filled with a gentle stew of meat chunks swaddled in slightly sweet sauce. These baked buns are largely responsible for not only keeping this restaurant forever busy, but earned it a star that would be the envy of the tens of thousands of chefs in France.